Last fall’s wet weather made it troublesome to find a good window of time to pump manure. 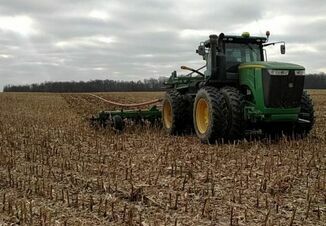 Because of this, some producers are trying to get their pits pumped out now, while the ground is frozen, says Ted Funk, retired University of Illinois Extension ag engineer. Pumping pits in below-freezing temperatures is a risky business, Funk says. Adhering to strict safety protocols can minimize these risks especially when used with proper ventilation and agitation practices. Funk shares 10 tips to control the risks. 1. Review your emergency action plan with all workers and have emergency contact numbers available at the site. Know the process and give a pocket emergency-response guide to everyone involved with manure pumping and spreading. 2. Prior to agitation or pumping, turn off electrical power to any non-ventilation equipment, and extinguish any pilot lights or other ignition sources in the building. 3. Fully open all ventilation curtains or ventilation pivot-doors. Run ventilation fans at maximum speed. 4. 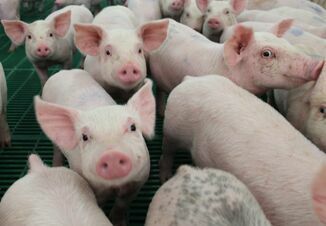 Take pigs out of the building, if possible, and run ventilation fans at maximum speed to get as much fresh air as possible into the building. 5. Ensure that all people are out of the building and clearly tag all doors noting that the building is unsafe for entry during agitation and pumping. 6. Always start the agitation process slowly and increase speed over time. Agitate the manure keeping the jet of pressurized manure below the liquid surface. Don't let the jet of manure strike walls or columns in the pit. 7. Use care during agitation of manure in underfloor pits, keeping workers out of buildings and watching for signs of animal distress. 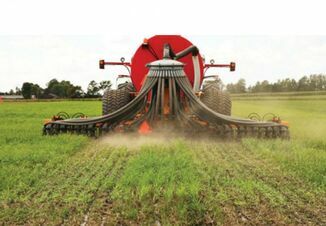 Avoid "rooster tails" above the surface when you first start to agitate. 8. Continue maximum ventilation for thirty minutes after pumping has ended before re-entering the building. 9. NEVER enter a building or manure storage structure when liquid manure is being agitated or pumped. Put up signs or hang tags to keep people out. 10. Consider getting a hydrogen sulfide (H2S) single gas monitor for anyone who must be inside a building during pit pumping. This especially applies to sow units; in finishing units, people should always be out of the building during agitation and pumping. Funk says he hears from more of the sow unit managers that they never let anyone stay in the building during manure pumping. Find single gas monitors at safety supply houses; monitors that are good for two years cost about $100 each.